The heart is a muscular organ that acts like a pump to send blood throughout the body all the time. It has four chambers – two on the left side and two on the right. The two upper chambers are called the atria, and the two lower chambers are called the ventricles. The two sides of the heart are divided by a muscular wall called the septum. Each side of the heart has a ‘one-way valve system’, which means that the blood travels in one direction through the heart – a bit like a one-way system. The heart is at the centre of the circulatory system, which delivers blood to all areas of the body. An electrical system regulates the heart and uses electrical signals to contract the heart’s walls. When the walls contract, blood is pumped into the circulatory system. The circulatory system is made up of a network of blood vessels, such as arteries, veins, and capillaries. The vessels in this network carry blood to and from all areas of the body. A system of inlet and outlet valves in the heart’s chambers works to ensure that blood flows in the right direction. The heart is vital to the health and nearly everything that goes on in the body. Without the heart’s pumping action, blood can’t circulate within the body. The blood carries the oxygen and nutrients that all organs need to function normally. Blood also carries carbon dioxide, a waste product, to the lungs to be passed out of the body and into the air. A healthy heart supplies the areas of the body with the right amount of blood at the right rate needed to function normally. If disease or injury weakens the heart, the body’s organs won’t receive enough blood to function normally. The heart is located under the ribcage in the centre of the chest between the right and left lung. It’s shaped like an upside-down pear. The size of the heart can vary depending on the age, size, or the condition of the heart. A normal, healthy, adult heart most often is the size of an average clenched adult fist. Some diseases of the heart can cause it to become larger. The illustration shows the front surface of the heart, including the coronary arteries and major blood vessels. The heart is the muscle in the lower half of the picture. The heart has four chambers. The right and left atria are shown in purple. The right and left ventricles are shown in red. Connected to the heart are some of the main blood vessels – arteries and veins – that make up the blood circulatory system. The ventricle on the right side of the heart pumps blood from the heart to the lungs. When you breathe air in, oxygen passes from the lungs through blood vessels where it’s added to the blood. Carbon dioxide, a waste product, is passed from the blood through blood vessels to the lungs and is removed from the body when you breathe air out. 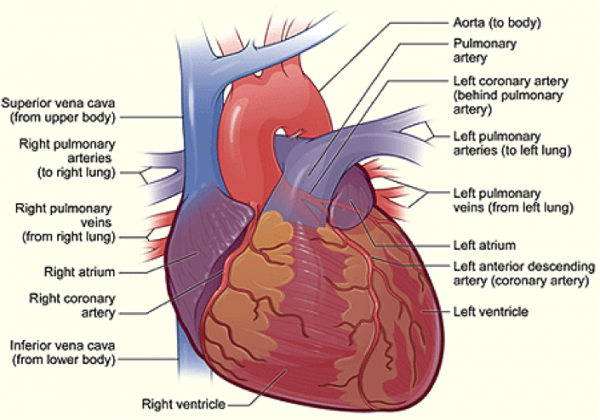 The atrium on the left side of the heart receives oxygen-rich blood from the lungs. The pumping action of the left ventricle sends this oxygen-rich blood through the aorta (a main artery) to the rest of the body. The superior and inferior vena cavae are in blue to the left of the muscle as you look at the picture. These veins are the largest veins in the body. They carry used (oxygen-poor) blood to the right atrium of the heart. “Used” blood has had its oxygen removed and used by the body’s organs and tissues. The superior vena cava carries used blood from the upper parts of the body, including the head, chest, arms, and neck. The inferior vena cava carries used blood from the lower parts of the body. The used blood from the vena cavae flows into the heart’s right atrium and then on to the right ventricle. From the right ventricle, the used blood is pumped through the pulmonary arteries (in blue in the centre of picture) to the lungs. Here, through many small, thin blood vessels called capillaries, the blood picks up oxygen needed by all the areas of the body. The oxygen-rich blood passes from the lungs back to the heart through the pulmonary veins (in red to the left of the right atrium in the picture). Oxygen-rich blood from the lungs passes through the pulmonary veins (in red to the right of the left atrium in the picture). It enters the left atrium and is pumped into the left ventricle. From the left ventricle, the blood is pumped to the rest of the body through the aorta. Like all of the organs, the heart needs blood rich with oxygen. This oxygen is supplied through the coronary arteries as it’s pumped out of the heart’s left ventricle. The coronary arteries are located on the heart’s surface at the beginning of the aorta. The coronary arteries (shown in red in the drawing) carry oxygen-rich blood to all parts of the heart. The illustration shows a cross-section of a healthy heart and its inside structures. The blue arrow shows the direction in which low-oxygen blood flows from the body to the lungs. The red arrow shows the direction in which oxygen-rich blood flows from the lungs to the rest of the body. The right and left sides of the heart are divided by an internal wall of tissue called the septum. The area of the septum that divides the two upper chambers (atria) of the heart is called the atrial or interatrial septum. The area of the septum that divides the two lower chambers (ventricles) of the heart is called the ventricular or interventricular septum. The picture shows the inside of the heart and how it is divided into four chambers. The two upper chambers of the heart are called atria. The atria receive and collect blood. The two lower chambers of the heart are called ventricles. The ventricles pump blood out of the heart into the circulatory system to other parts of the body. 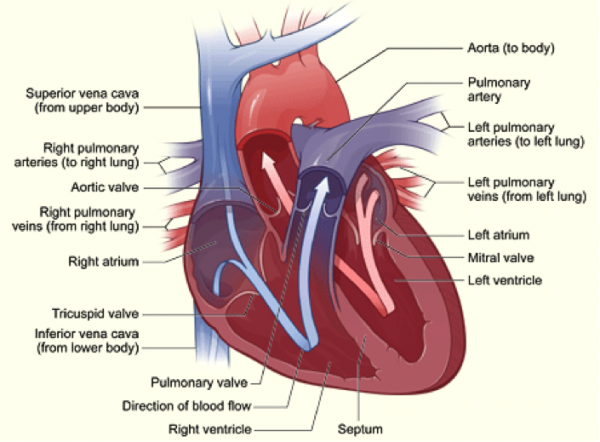 The picture shows the heart’s four valves. Shown anti-clockwise in the picture, the valves include the aortic valve, the tricuspid valve, the pulmonary valve, and the mitral valve. The arrows in the drawing show the direction that blood flows through the heart. The light blue arrows show that blood enters the right atrium of the heart from the superior and inferior vena cavae. From the right atrium, blood is pumped into the right ventricle. From the right ventricle, blood is pumped to the lungs through the pulmonary arteries. The light red arrows show the oxygen-rich blood coming in from the lungs through the pulmonary veins into the heart’s left atrium. From the left atrium, the blood is pumped into the left ventricle, where it’s pumped to the rest of the body through the aorta. For the heart to function properly, the blood flows in only one direction. The heart’s valves make this possible. Both of the heart’s ventricles has an “in” (inlet) valve from the atria and an “out” (outlet) valve leading to the arteries. Healthy valves open and close in very exact coordination with the pumping action of the heart’s atria and ventricles. Each valve has a set of flaps called leaflets or cusps, which seal or open the valves. This allows pumped blood to pass through the chambers and into the arteries without backing up or flowing backward. Almost everyone has heard the real or recorded sound of a heartbeat. When the heart beats, it makes a “lub-DUB” sound. Between the time you hear “lub” and “DUB,” blood is pumped through the heart and circulatory system. A heartbeat may seem like a simple event repeated over and over. A heartbeat actually is a complicated series of very precise and coordinated events that take place inside and around the heart. Each side of the heart uses an inlet valve to help move blood between the atrium and ventricle. The tricuspid valve does this between the right atrium and ventricle. The mitral valve does this between the left atrium and ventricle. The “lub” is the sound of the mitral and tricuspid valves closing. Each of the heart’s ventricles has an outlet valve. The right ventricle uses the pulmonary valve to help move blood into the pulmonary arteries. The left ventricle uses the aortic valve to do the same for the aorta. The “DUB” is the sound of the aortic and pulmonary valves closing. Each heartbeat has two basic parts: diastole (or relaxation) and atrial and ventricular systole (or contraction). During diastole, the atria and ventricles of the heart relax and begin to fill with blood. At the end of diastole, the heart’s atria contract (an event called atrial systole) and pump blood into the ventricles. The atria then begin to relax. Next, the heart’s ventricles contract (an event called ventricular systole) and pump blood out of the heart. The heart uses the four valves to ensure the blood flows only in one direction. Healthy valves open and close in coordination with the pumping action of the heart’s atria and ventricles. Each valve has a set of flaps called leaflets or cusps. These seal or open the valves. This allows pumped blood to pass through the chambers and into the blood vessels without backing up or flowing backward. Blood without oxygen from the two vena cavae fill the heart’s right atrium. The atrium contracts (atrial systole). The tricuspid valve located between the right atrium and ventricle opens for a short time and then shuts. This allows blood to enter into the right ventricle without flowing back into the right atrium. When the heart’s right ventricle fills with blood, it contracts (ventricular systole). The pulmonary valve located between the right ventricle and pulmonary artery opens and closes quickly. This allows blood to enter into the pulmonary artery without flowing back into the right ventricle. This is important because the right ventricle begins to refill with more blood through the tricuspid valve. Blood travels through the pulmonary arteries to the lungs to pick up oxygen. Oxygen-rich blood returns from the lungs to the heart’s left atrium through the pulmonary veins. As the heart’s left atrium fills with blood, it contracts. This event also is called atrial systole. The mitral valve located between the left atrium and left ventricle opens and closes quickly. This allows blood to pass from the left atrium into the left ventricle without flowing back into the left atrium. As the left ventricle fills with blood, it contracts. This event also is called ventricular systole. The aortic valve located between the left ventricle and aorta opens and closes quickly. This allows blood to flow into the aorta. The aorta is the main artery that carries blood from the heart to the rest of the body. The aortic valve closes quickly to prevent blood from flowing back into the left ventricle, which is already filling up with new blood.